Volition Community (www.volitioncommunity.org) process personal data in compliance with the General Data Protection Regulation (GDPR) (EU) 2016/679. We use the information, including personal data, supplied by you as part of the process of assessing applications, monitoring the use of grants and publicising grants that we receive. To comply with the General Data Protection Regulation (GDPR) (EU) 2016/679, we require your consent to use personal data supplied by you in the processing and review of your information. This includes transfer to and use by such individuals and organisations as Volition Community deems appropriate. Volition Community requires your further assurance that personal data about any other individual is supplied to Charity with his/her consent. Accepting funding and/or acceptance onto the programme confirms your consent and assurance. Volition Community will not sell, rent or lease your information to third parties. We may share information with other funders operating in the same areas of charitable interest, and we may also share the information you give us with other charitable organisations, public bodies and universities for the purposes of research, analysis, policy development or other purpose. 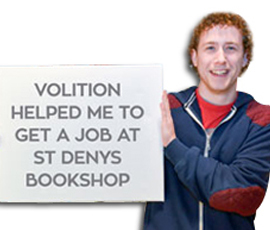 In addition, Volition Community may share information with other relevant agencies or organisations to help us perform statistical analysis, send you emails or postal mail or inform you about their activities. What Happens if we Make a Change to This Policy?